I’m fascinated by pilgrimage. For me the term connotes earnestness, persistence, solitude, inspiration, a touch of holiness. It’s rising above the mundane, a shedding of the constraints of the banal. Pilgrimage is both dogged pursuit and quiet surrender. It’s estimated that over 100 million people go on pilgrimage journeys each year. They leave their homes and their everyday lives behind for a week or a month or longer to pursue an elusive goal of peace and balance and connection. They come from diverse backgrounds and they engage in pilgrimage for a variety of reasons, but in every case, it’s by definition a pause in their normal lives. Some go it alone and others travel with a partner or small group. 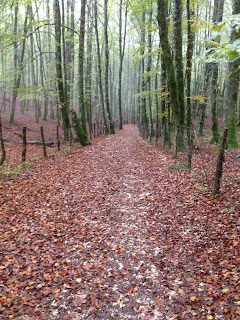 I know several people who are currently walking the Camino de Santiago – a roughly 800 kilometer route through Spain and France – the Way of St. James. I confess that I’m more than a little bit envious and I’m enjoying their journeys vicariously through Facebook updates and pictures. A few weeks ago I met a pilgrim of another sort. He was born in Somalia and lived there until he was 8 years old when he left his home and his father (his mother had died when he was a toddler) and struck out for… somewhere else. He was a child. I don’t know who he traveled with exactly but I imagine that it was a group of relatives and neighbours, a group drawn together by desperation and faint hope. In any event, he arrived at a refugee camp in Kenya after a long and unimaginably arduous trek – 800 kilometers of determination and deprivation. Most people might not immediately think of the flight of a refugee as a pilgrimage, but I do. This young boy then spent 12 years in the refugee camp before winning the proverbial lottery. His name was posted on the camp board listing those who had been selected by the United Nations Refugee Agency (UNHCR) to be sponsored by a foreign government to go… somewhere else. A promised land. He arrived in Canada a few months ago and his pilgrimage continues as he learns how to live in another country and culture and language. I can’t help but think about the contrast between walking 800 kms. 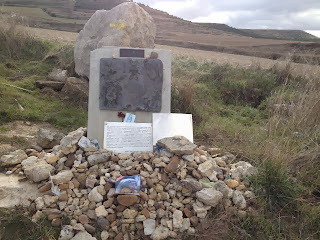 on the Camino de Santiago and walking 800 kms. from Mogadishu, Somalia to Dadaab, Kenya. Both are pilgrimages and those who walk those well worn paths are pilgrims. Some of them are well clothed and well fed. They sleep each night in modest comfort and security. Others have the clothes on their back and are grateful for whatever scraps of food they can muster along the way. They walk in the company of other displaced souls, with only their prayers for security. 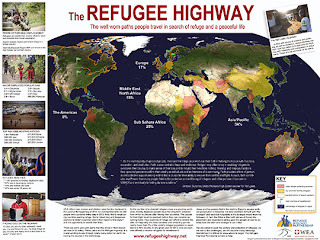 The risks along this refugee highway are many. To be sure, there are many differences between what I’ll call the “pilgrims of privilege” and the “refugee pilgrims”, but what they have in common, I suspect, is that they are all pawns of powers beyond their jurisdiction. They are buffeted by strong winds of anxiety, fear and dissonance and propelled by a glimmer of hope – hope that the life behind them is not all there is. Refugees are fleeing some kind of oppression or persecution or deprivation: political, economic, physical, spiritual, and now also ecological (“climate refugees”). They are leaving an intolerable situation in search of refuge – a safe place, a sanctuary from the brutal forces that beset them. Since its inception in 1950 the UNHCR has helped an estimated 50 million refugees start new lives in foreign lands. They come from some 126 countries around the world where life is not just perplexing but impossible. These uprooted and desperate people leave family, friends and all that is familiar behind. Those that make it to UN Refugee Camps are the lucky ones among the many millions more who are displaced and have no safe haven. It’s pretty easy to imagine that these refugees are pawns of forces beyond their control – those who have fallen through the cracks of a globalized economic world system with its “winners” and “losers”. But what of the 100 million who can voluntarily set aside their responsibilities and routines to embark on a short term pilgrimage? Here’s what I think. I see evidence of soul-sapping alienation everywhere I look. These pilgrims come from the western world, from countries that have generally high standards of living. In many cases, they have everything that money can buy, but it’s not enough – and from a global perspective it’s TOO MUCH. Our consumer addictions are stripping the planet of its magnificent resources. Money doesn’t buy happiness. Material things don’t satisfy our deepest yearnings. And though we know it, the undertow of a consumer culture (and the emotional havoc it stirs up) is often too powerful, even for the reasonably prudent. Even for the thoughtful and caring. A pilgrimage journey – a pause from the rat race of contemporary life – promises a chance to recalibrate, to align body, soul and spirit. To take stock. 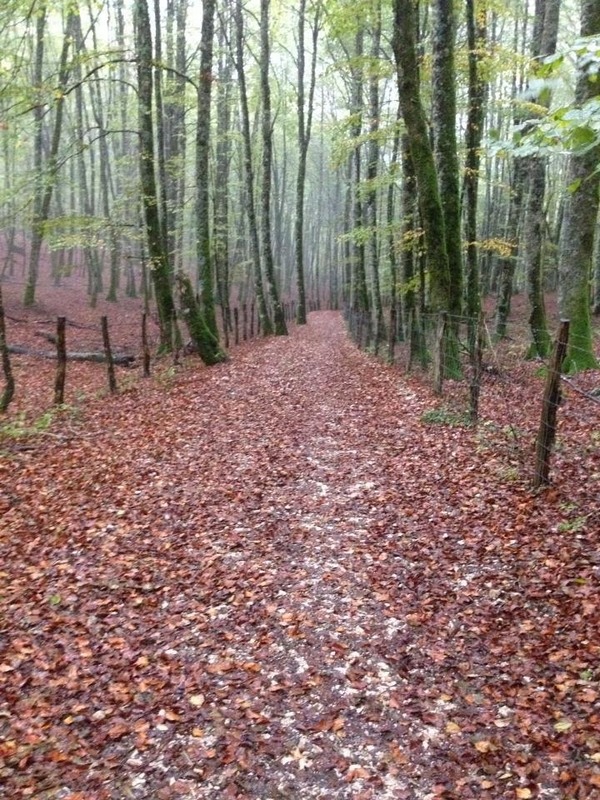 Many pilgrims are looking for a chance to find a different path, a more intuitive and authentic path. A path that circumvents the riptides and undertows of a globalized world on the brink of absolute insanity. Is Child Labour always bad? If you're like me the thought of child labour probably makes you cringe. I envision something like this photo shows: a young child spending hours every day in repetitive (and sometimes dangerous) work. This image violates my sense of justice because I believe that the child is being ruthlessly exploited. He or she is forced to work in order to help the family survive, or - more horrifically - because they have no family and are working for their own survival or are the "property" of a ruthless "employer". I understand that the working conditions for many child labourers are entirely unsatisfactory and even inhumane. I'm shocked by the images I occasionally see on news reports when a factory collapses in Bangladesh or fire rips through a garment factory in Pakistan. I wonder how it is possible that such conditions could exist in the 21st century. Child Labour becomes the catch phrase for that which I despise. Not all work done by children should be classified as child labour that is to be targeted for elimination. Children’s or adolescents’ participation in work that does not affect their health and personal development or interfere with their schooling, is generally regarded as being something positive. They go on to say that "the term 'child labour' is often defined as work that deprives children of their childhood, their potential and their dignity, and that is harmful to physical and mental development." I can't help but think that our understanding of what might be harmful to the physical and mental development of children is heavily influenced by our culture and specifically - in the western world - by our affluence and the way this has fundamentally shifted our view of many things. In Canada there are regulations that define appropriate conditions for youth labour (see http://www.naalc.org/migrant/english/pdf/mgcanchl_en.pdf). Each province has guidelines that address questions like the age at which youth may legally be employed, the number of hours/day they may work, and the kinds of work they may (or may not) do. In most cases children and youth are expected to be in school until they have graduated and paid work must not affect their school attendance. This all makes sense, right? As a society we put a high value on having every child graduate from high school because we believe that a high school education is a minimum requirement for future employment and, ultimately, for success in the workplace and in life. But it hasn't always been so. For those who grew up in rural areas of Canada, you may remember (or have heard stories) of children working alongside their parents in factories or fields, sometimes in addition to their schooling or sometimes for a season, instead of being in school. In the fishing community where I live, there was a time when it wasn't at all uncommon for whole families to move to a different community for part of the year and work together at a fish processing plant. The arrangement wasn't necessarily exploitative and one might argue that there was actually some value for the child in being part of this cycle. Or consider children who annually were expected to work in the potato fields or the blueberry fields during harvest time. This work gave them some income and taught them the value of manual labour AND of the connection between work and money. Sometimes I wonder if my generation - the baby boomers - have overshot the mark. That is, in our efforts to help the next generation - our kids - succeed, we have tried to minimize their struggles. We want to protect them from the harsh realities of adulthood and provide for them a life that is carefree. But what has this approach yielded? Are we raising children who have dignity and can realize their potential? Are they experiencing optimal physical and mental development? The evidence suggests - despite our very good intentions - that we have missed the mark. We have spared them from exploitation and from "growing up too fast", but I think we have to acknowledge that the current rates of childhood obesity, diabetes, and other physiological ailments as well as various psychological and behavioural disorders are alarming. And in terms of dignity, that's a harder value to measure, but I suspect that many of our kids are growing up in social environments that are extremely hazardous to their sense of who they are. We probably all know of kids in our communities who have been victims (or perpetrators) of cyber bullying of one form or another. Our high schools have too often become war zones where kids are exposed to every kind of temptation and debauchery imaginable and they too - like kids in factories in India or Pakistan or Bangladesh - are fighting to survive. Outwardly they may look like they have a great life - designer clothes, the latest technological gadgets, money to spend on entertainment and the latest fads - but appearances can be deceiving. Their struggles are not the same but in both cases, there are many dangers and pitfalls. Of course I'm not suggesting that the solution is to put all our kids back to work. But I do think that we need to be careful of following the cultural drift toward ever-increasing self-direction for our children and youth. Kids need direction and guidance and even the occasional boundary. And in a secular society we can't expect or assume that they will get all they need in terms of moral instruction in school. I believe - and I believe it with more and more conviction - that children NEED to learn many things from their parents, grand-parents, extended families, communities and churches. A secular society has its limits. But perhaps you're thinking that I'm comparing apples and oranges. Surely I can't be comparing the situation of a young child labourer in India today to the labour of Canadian kids a few decades ago or to the challenges they face today. These are totally different scenarios. And I agree that they are. But here's the thing. We have a tendency to assume that the developing countries should learn from us and follow our example. So for me the challenge is to find the elusive happy medium - to vigorously and persistently advocate against the exploitation of children so that they may grow up with a sense of their value and with dignity. But we should also vigorously and persistently advocate against the conditions at the other end of the spectrum where we mistakenly think that we can keep our kids safe if we protect them from responsibility but inadvertently expose them to a brutal social environment. God help us to create societies where children can truly thrive and grow! 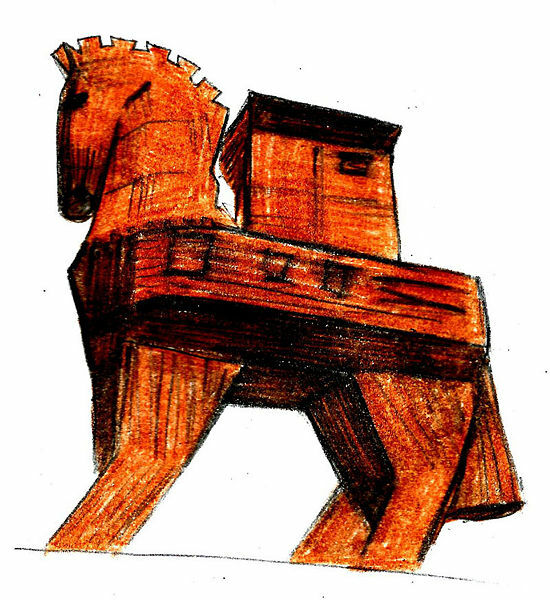 Reflections on Cuba: Is Tourism a Trojan Horse? In May I went to Cuba with 5 seminary students through Praxis – a scholarship program designed to give students an opportunity to see first hand the work of Canadian Baptist Ministries with one of their international partners - in this case The Fraternity of Baptist Churches of Cuba. The students and I spent 18 days in Cuba, living with Cuban families, studying with Cuban seminary students and pastors, traveling, thinking, watching, worshipping, talking, learning, un-learning, re-learning. It was a truly incredible time! There’s an excellent documentary that I’ve used in some of my classes called Life and Debt which contrasts the Jamaica that tourists see with the “real” Jamaica and even though Cuba is not Jamaica (thanks – really! - in large part to the US embargo), I think some of the same principles apply: western tourists come to get away from the stresses and tensions of life at home (and of course in many cases, to get away from harsh winter climates!). The Jamaicans, Cubans, Mexicans and other ethnic groups that serve us in their tropical resorts have no such opportunity to escape their everyday challenges. The all-inclusive bracelet that clearly identifies the “haves” from the “have-nots” is perhaps something that they dream about – a representation of the “good life” - but with little hope that it will ever be worn on their own wrists. I took advantage of every opportunity to talk with Cubans during the Praxis trip about tourism. I was curious to know how they see it and it turns out that that depends on what they see. In areas where there are no (or very few tourists), like in Guanajay (where I stayed with a local family for a week), I heard comments like this: “we don’t see any benefit from tourism here. The government says tourism is good for Cuba but they just take the money from tourism and invest it in other projects. It hasn’t improved our lives at all.” In other areas – near Varadero, for example - some people were quick to point out that the growth of tourism had actually increased the cost of living for Cubans in the area. For Cubans, work within the tourism sector is far and away the most lucrative employment option – all kinds of professional people have given up work as teachers, doctors, lawyers, engineers, etc. to work in resorts where they can make a lot more money – or at least that’s what I heard. Amongst the students and at a pastors’ retreat we talked about the church and her response to tourism. How is tourism affecting Cuban’s understanding of the gospel? When we come to Cuba as tourists, are we bringing with us more than the dollars and the miscellaneous toiletries and clothing that we will leave behind? 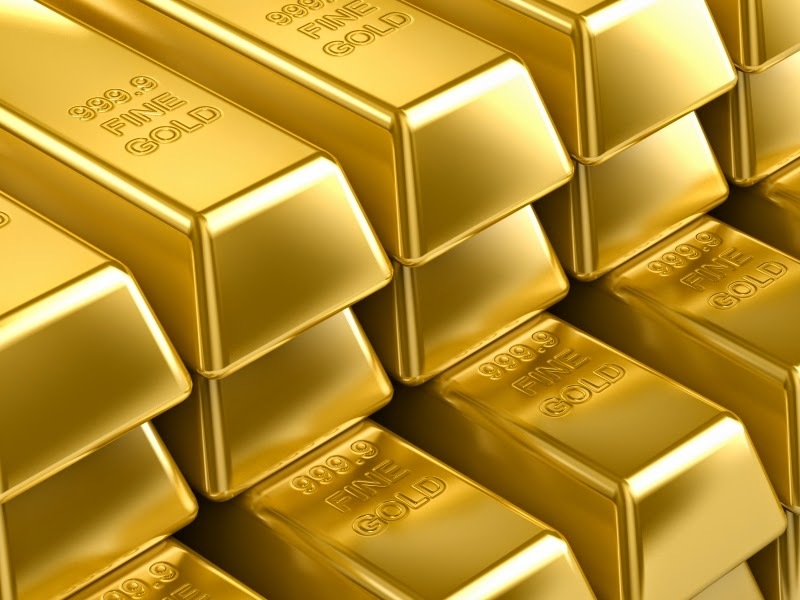 If Cubans see the all-inclusive bracelet as the symbol of prosperity and a good life, is there a danger that we are spreading the “affluenza virus” (if you’re a regular reader of this blog you will likely remember several references to a book by Oliver James called Affluenza which argues that affluence is like a virus which infects us and produces all kinds of alarming symptoms – things like depression, anxiety, and other mental illnesses). It seems to me that tourism IS affecting all of Cuba in that it is bringing a steady flow of western ideas and western cultural values – individualism, materialism, pluralism – not to mention assumptions about the superiority of capitalism and democracy, into a country that many would describe as “deprived”. Perhaps those who see Cuba as deprived would be surprised to learn that Cuba ranks 59th (out of 187) on the United Nations’ Human Development Index, a ranking based on health, education and income. Cubans generally don’t have access to the Internet and since most Cubans don’t get to travel out of country, it's pretty much impossible for Cubans to have any accurate sense of how life in Cuban compares with life in other countries. When I asked the Cuban students where they think Cuba ranks on the Human Development Index, they laughed and said that they doubt that Cuba even makes it onto the scale. The reality that they know is so far removed from what they see of the West on TV or in the lives of tourists and other visitors, that they can't imagine that life could be any worse anywhere else in the world. They haven't been to Haiti, or Jamaica, or the Democratic Republic of the Congo, or Liberia, etc. etc. etc. The truth is that as hard as life is for Cubans, it is a LOT tougher in many, many countries. In the absence of good quality and well-rounded information, I Cubans naturally evaluate themselves relative to what they see: tourists and the few other westerners that come to Cuba on business or for humanitarian or educational purposes (like the Praxis team and CBM more generally). And here’s the thing that I think we all need to be cognizant of: our perception of reality and our understanding of Scripture are inevitably influenced by our native culture and its norms and values. We can’t help it and even when we’re aware of it, we can’t fully control it or change it. By our very nature, we are ethnocentric (which means that we are biased in our own favour – we judge others based on the assumption that our way of thinking and the way we do things is really BETTER than any other way). And so, even though there are clear indications that "our way" - our assumption that bigger is better, our perpetual and insatiable desire for economic growth, our propensity to assume that technology can solve our problems - is actually quite unsustainable, both from an ecological and an economic perspective, we continue to think that the rest of the world needs to be more like us. Frankly, it's absurd. I believe that the wisdom of Scripture can help us all to discern what's needed at this moment in history, but the essential prerequisite for that quest is a genuine hunger and thirst for righteousness and a willingness to submit to the wisdom that we discover. I suspect that we may actually discover that our partners in Cuba (and elsewhere) can help us as much as - or more than! - we can help them. I’m beginning to really dislike the axiom, “everything in moderation.” I’ve been on enough diets to know that such “wisdom” can seem to portion out hope and alleviate guilt. Hope that I don’t have to give up things I love; hope that a little bit – even a little bit of something very bad - won’t hurt; hope that my appetites can be tamed and shrunk, managed so that I can be moderate. Not too big and not too small. Neither hot nor cold. Lukewarm. This kind of wisdom seems to have settled into my bones. It seems so right… so incredibly rational and sensible. Moderation has such a common sense appeal... But everything? What does that leave out? It’s not a trick question. Everything means EVERYTHING – nothing left out. So here’s where I take issue. I don’t want to be a little bit generous or a little bit compassionate or a little bit patient or a little bit loving or a little bit forgiving. If I’m honest – and by that I don’t mean moderately honest, but full on, nothing-to-hide or fear, honest – I think that moderation may be a clever trap; in fact, a colossal deception. It numbs and placates us and leaves us bland and passionless. OK. I suppose that there are SOME circumstances in which moderation is a better option than excess. But at ALL times and in ALL circumstances? Perhaps moderation is for those who lack courage. There – I’ve said it! Moderation - from this perspective - is an inevitable path to mediocrity and security. It’s settling for not bad, when good, better and best are all possible if we dare to defy the voices within and without which counsel moderation. I’ve lamented before – and I’ll lament it again! – that I am NOT a risk taker. Moderation comes naturally to me. But I’ve always admired people who live immoderately. So as I think about living as a disciple of Christ – as someone who (to the best of my knowledge and ability) WANTS to be “all in”, I wonder what that really means. What does it look like? And here’s what I’m thinking: maybe there are different ways and means of being immoderate. What if the body of Christ is healthiest and most compelling when we combine our immoderate talents and passions and energies. Maybe we don’t all have to be reckless and carefree in our physical beings; maybe there’s a need for immoderation in our collective thinking and even in our theology…? I may not be drawn to feats of extreme physical challenge and risk, but I AM drawn to - and committed to - thinking that refuses to conform to the well worn paths. And maybe - as we consider the coming of God's Kingdom, on earth as it is in heaven - immoderate thoughts and theology may actually be helpful in seeing past the obstacles that seem to be blocking the path. Poverty, pain, persecution... injustices of all kinds can seem to be immovable. They are resistant to so many of our efforts, but I wonder if that could be because our thinking is wrong, or at least a little bit off the mark. And although it may be foolish and unduly rash to engage in a wholesale re-thinking of our basic presuppositions and then careful examination of the layers that have been added, maybe that is just what is needed for the church to fully engage in today's world. Despite any appearances to the contrary, the fields ARE white unto harvest. God IS faithful and just - he will neither leave us nor forsake us. He is - even as we go about our daily lives - working all things together for our good and for the good of the Kingdom. If we really believe these things, there is no need to fear. God is not moderately good or moderately faithful. When it comes to our faith and our living out of that faith, let's not be moderate either! To be, or not to be, that is the question. So begins perhaps the most famous literary quote of all time. It's the opening phrase of a soliloquy in William Shakespeare's play, Hamlet (Act 3, Scene 1). While interpretations of the meaning of this famous phrase vary, it seems clear that Hamlet is wrestling with profound internal dissonance as he contemplates not just the meaning of life, but the meaning of his life at this particular point in time. What is life for? Where is meaning and purpose to be found? Can one be passive in the face of injustice and suffering? Can one act, or is such action futile or even fatal? Some 400 years have passed since Hamlet first voiced this most fundamental and wrenching question on stage. 400 years of human achievement and human debauchery. Is it still a valid question for those who contemplate life's meaning? Actually, it seems to me that the question the Millennial's ask (also known as Generation Y) is whether or not life can be trusted. 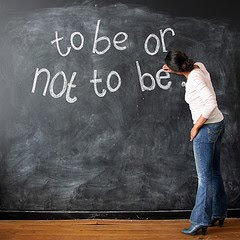 To be or not to be is a question for an individual; someone who is disconnected and maybe disenfranchised. It's not a question for anyone who loves or is loved. For us it's not so much about physical or material existence but about the quality of our life and the manner of our living and our relationships. Are we real? Do we allow people to see us as we are? Do we struggle in the open and bleed when we're wounded? Or do we cover up? Hide behind the lines? Craft an image that we think we want to be and then manufacture an identity that measures up? Is it all about what things appear to be, or what they really are? Do we even know what they are, or are we so lost in the maze of fantasy that we can't distinguish between truth and fiction? Social scientists are beginning to investigate the effects of social media and networking on identity. Does Facebook allow us to be "someone else" - a fabrication of an identity that we aspire to? Or does it allow us to be more genuinely "ourself" than is possible in more traditional kinds of face to face networks? To be or not to be. Hm. Imagine that you are a person with a "disability". Maybe it's a physical disability - something readily apparent, like a withered arm or a hunched back or a scar on your face. You may feel that this feature defines you when you are in public - it's the first thing people notice about you. Or maybe it's an intellectual or emotional disability - a mental illness or a learning issue. Even though it may not be as obvious as a physical condition, it too can become a label that obscures your true identity and value. Social media sites like Facebook may actually allow you to BE who you are in a much more holistic sense. I came across an article today that addresses this issue: http://www.bbc.co.uk/news/technology-21084945 - and it's making me think about social media in a new light. I realize that I tend to view social media from one particular vantage point and it's easy to assume that my experience is somehow authoritative. But as I struggle to understand the pain and frustration that people on the fringes of society experience, I'm reminded that my experience is NOT the only gauge. To be inclusive in a "love your neighbour as yourself" sort of way requires that I don't let my own experience define the boundaries for what is right or just or fair. Certainly there are down sides to technology and social media, but there are up sides too. Fact is, we all struggle to understand ourselves and to find our place in the world. It's not easy. Perhaps it would be fair to say that we all have to negotiate and manage our identities. And social media is just one more venue. When we are truly ourselves - publicly and privately - and when we can see the heart of each person in our network, and not just their appearance or ability/disability, maybe we'll spend less time contemplating Hamlet's question and more time just BEING and encouraging others to also BE. We’re living in a time of great intensity. I often feel like I’m rushing through life and my senses are seriously over-stimulated. The colors are vibrant – we can see in high def, in 3d. IMAX formats are so "real" that we even feel that we're part of a scene. Did you know that the human eye can detect more than 2.4 million colors? And yet what we most long to see we still see through a glass darkly. The sounds are incredible – technology amplifies the most subtle nuances of music and voice. Audiologists tell us that the human ear can hear frequencies ranging from 20 – 20,000 hz. And yet God’s still small voice is often muffled and muted. For all of our sophisticated technology, life and faith can be frustratingly out of focus. Those “thin” moments - moments when the distance between our world and God seems so thin as to be almost translucent - are sweet to our souls, but for me anyway, all too rare. We sometimes multi-task our way through life and miss the richness of the good things that surround us. The beauty of nature, of course, but also the sustenance of friendship and the spectacle of innovation. I wonder if our failure to see and fully appreciate all of the good there is in this world is a sin of omission? Could it grieve God as much as our active sins of character? Now that the craziness of the Christmas season is behind us (the tree and its trimmings are stashed away and the various indulgences of the season have perhaps left us a bit poorer and heavier!) and the New Year is well underway, it's a good time to reflect – to re-focus. God with us – what does that mean? God is in our midst. He's here! He's in our friendships, our stress. God is in our laughter and in our heart ache; our study and our coming and going. God is with us in our hopes and fears and in our doubts. God is with us even when we’d prefer that he keep his distance. God is with us – everywhere and always. God help me, day by day!